If you're afraid a full shot might reach the green while the foursome ahead of you is still putting out, you have two options: you can immediately shank a lay-up or you can wait until the green is clear and top a ball halfway there.. It is surprisingly easy to hole a fifty foot putt....For a 10. I know there are a lot of individuals out there, that didn't do an annual golf trip last winter. The economy has affected everyone in some shape or form. Even Greg Norman mentioned at the Open Championship, having to lay off employees for the first time in his business career. There are and will be a lot of great packages out there for all the areas we cover. This is where the Golf Vacation Specialist comes in. We live and play in the areas we are responsible for. We understand the need for golfers to get the biggest bang for their buck - most golfers want everything, but don't want to pay for it. There are a lot of things that golfers can do to get a great golf package. The first and most important thing you can do, is talk to your Golf Vacation Specialist. We can offer a lot of insight and less expensive alternatives, that most golfers may not be aware of. Golfers need to have some kind of budget in mind for their trip. These budgets need to be realistic; based on your choices of location, lodging and golf courses. If you have a lower budget in mind, please understand that you cannot play all high end courses and stay within your budget. There are certain times of year and certain areas that this is possible. Most all golf course rates are based on seasons. Winter packages in Florida for example, will be higher priced than Myrtle Beach - mainly due to weather conditions. The individual person putting the golf package together, needs to be right up front and honest on the budget for the group. If you discuss this with your individual Specialist, he or she can get you everything you need within your budget. Keep in mind; that you may have to scale down lodging expectations and golf courses, to stay within your budget - especially during peak seasons in each specific area. Each Golf Vacation Specialist can do this very quickly and get you that "Biggest Bang for your Buck". You can go online and do numerous quotes on areas that you may not be that familiar with. This can be very time consuming and not get you what you may need or want. Do that initial quote, which will have the name of your representative on it. Next step would be to contact that particular representative via phone or email. Once the specialist has an idea of what type of package your looking to put together - Dates, # of players, # of rounds and most important - BUDGET PER PLAYER. It becomes a very simple process to get from point A to point B. There are also a lot of individuals out there that like to book everything on their own for the group. This is OK, but having someone in the area you're looking to do a package in - can make the process much easier and less phone calls for the group leader - calling hotels, golf, etc... Yes, an individual can put a good package together, doing everything on his own. The major difference working with a Golf Vacation Specialist - we will be honest and up front about specific lodging and golf courses. You will never have someone at hotel or golf course tell you that their lodging property is so so, or the same for a golf course. We, as Golf Vacation Specialist's, will tell you right up front, our honest opinion on lodging and golf. We as a company do a lot of repeat business. We are the so-called 'experts' in the areas we cover, and our repeat clients trust us every year to set up their package for them. You will see on our website, that we offer a lot of hot deals for each specific area. These are great ways to do an inexpensive golf package with great courses and resorts. We put these hot deals together due to the fact that our vendors have gotten very aggressive with us in pricing, or we know some very specific lodging and golf courses, that we have great deals with. If you see a hot deal, chances are - this is a great package for the money. Please try and be flexible with the areas you may want to do a golf package. Your specialist may know of some other areas that you've never thought of, and may be a great golf destination. You may have been to a specific area the last couple years, but have never heard of or played other courses in that area. Also, the farther south you go in the winter - the higher the price goes. But each area can have an inexpensive alternative to keep the cost down, and make it still enjoyable. Some of the new areas we have added as a company, can get very aggressive with their pricing, due to the fact of trying to draw more golfers to that area. In a nutshell - your Golf Vacation Specialist is here to help, and can be your best resource in putting a golf package together. Take some time to contact us and discuss your needs and budget - we can make the process very easy for you. Try and be flexible with your destinations, courses and so on - we have something out there that's fantastic and you may have never thought about it. In these tough economic times - let us help bail you out of the work that goes behind putting a great golf package together. We, as a company, have a lot of great golf areas and will work our hardest to satisfy your every need. Please take some time to get to know us and you will have a Golf Vacation Specialist for life. A short time ago, I took a familiarization trip to Biloxi, Mississippi. Not only was I pleasantly surprised, but completed impressed. The quality of the courses and accommodations were top notch. Starting with the golf, I would have to describe the overall service and quality of conditions as nothing short of world class. The accommodations from the hotels to the condominiums were luxurious. We are all aware of the hurricane devastation in New Orleans because of our national media, but that same devastation was delivered to Biloxi as well. In the Southern tradition, Biloxi rallied and rebuilt a new and better community. Foremost, what stands out in my memory is the sense of community and fellowship. Biloxi is also a perfect example of Southern Hospitality. When considering your next golf vacation, with the added excitement of casino gambling, look no further than Biloxi - The Gem of the Gulf Coast. July 17, 2009, Myrtle Beach, S.C. — The Myrtle Beach Area Golf Course Owner’s Association (MBAGCOA) has named Shaftesbury Glen Golf & Fish Club the 2009 Myrtle Beach Golf Course of the Year. Inspired by celebrated courses like Winged Foot and Augusta National, architect Clyde Johnston designed a traditional British Isles course at Shaftesbury Glen Golf & Fish Club. Tucked into the forest and farmlands along South Carolina’s beautiful Waccamaw River, the course features wide fairways and elevated greens. The Shaftesbury Glen Clubhouse overlooks the Waccamaw River and offers tranquil views tailor-made for post-round relaxation. The MGAGCOA evaluates courses on conditions, quality of ownership and management, contributions to the community and efforts to improve the growth of the game. The Golf Course of the Year award has been given out since 1996. Shaftesbury Glen will now be judged statewide. Statewide winners move on for the chance to be named National Golf Course Of The Year. The flagship of The Glens Golf Group is Heather Glen, which is located in Little River, S.C. on a magnificent, 400-acre historic site. Designed by Willard Byrd and Clyde Johnston, the course opened in 1987. 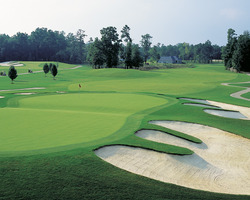 Known as the “Friendliest Course On The Beach,” Possum Trot has an honored place in the history of Myrtle Beach golf. One of the first ten championship courses built along Myrtle Beach’s Grand Strand, which now has more than 100 golf courses, Possum Trot has stood the test of time. The course’s Old English design features spacious fairways, challenging par 5’s, as well as flawlessly manicured greens and spectacular flower displays. Inspired by world-famous courses like Winged Foot and Augusta National, architect Clyde Johnston designed a traditional British Isles course at Shaftesbury Glen Golf & Fish Club, located on the banks of South Carolina’s beautiful Waccamaw River. I've decided to take a break from the golf blogs and start publishing some of my favorite recipes. I'm not only a golf vacation diva, I'm also a great cook! Chicken with Roasted Sweet Potato Salad. Heat oven to 425. On a rimmed baking sheet, toss the potatoes, onion, 2 T oil, 1/2 t salt and 1/4 t pepper. Roast until tender, 20-25 minutes, turning every 5 minutes or so. Rinse and pat dry chicken breasts, season with 1/2 t salt and 1/4 t pepper, I use a little more of each. Grill chicken approx 5-6 minutes on each side. Serve with the chicken. Enjoy!